Background: Studies have shown that exogenous miRNAs have cross-kingdom regulatory effects on bacteria and viruses, but whether exogenous plant miRNAs are stable in human body or participate in cross-kingdom regulation is still controversial. Objective: This study aims to propose a new method for the presence and cross-kingdom regulation pathway of exogenous Plant miRNA, which combines biological calculations and biological experiments. Method: Based on the high-throughput sequencing data of human health tissue, the tissue specificity model of exogenous plant miRNA can be constructed and the absorption characteristics will be excavated and analyzed. Then screening the exogenous Plant miRNA based on the crosskingdom regulation model of plant-human miRNA, and isotope labeling can be used to verify the presence and regulation pathway of exogenous plant miRNA. 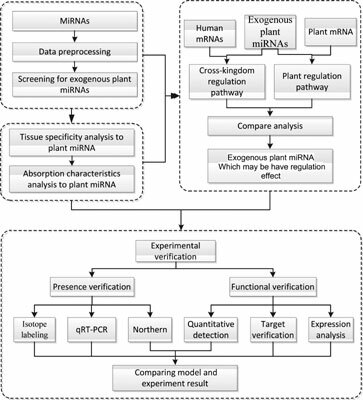 Results: Only based on a comprehensive analysis to human high-throughput miRNA data, establishing cross-kingdom regulation model and designing effective biological experiments, can we reveal the existence, access pathways and regulation of exogenous plant miRNAs. Conclusion: Here, we reviewed the most recent advances in the presence and pathway of exogenous plant miRNAs into human and their cross-kingdom regulation. Exogenous miRNAs, cross-kingdom regulation, absorption mechanism, expression level, RT-PCR, fluorescent labeling, isotope labeling.